Merriam-Webster dictionary defines improvement as the act or process of making something better. The Buffalo Sabres are nearly the literal definition of improvement this season. They’re in the process of making something better, there on ice product. As the 2015-16 season heads into the final quarter, the debate in Buffalo is has the team improved enough over last season? Many optimists, including myself, expected the Sabres to be more of a player in the Eastern Conference playoff race. The team is far from that and likely to be in the conversation for a lottery pick when the season is over. The overall objective of this season for the Sabres was to show improvement. So far through 57 games they have been a better team than last season, which isn’t saying a lot. Has Buffalo accomplished enough so far this season to convince the hockey world they’re heading in the right direction? Now, the good side. Buffalo finished last season with 54 points and with 25 games remaining are currently only two points away from matching that total. Sure, you can argue that last seasons point total was deflated by the “tank wars” to ensure an opportunity at either Jack Eichel or Connor McDavid. That being said, the Sabres are still on a pace for around 74 points which would be a 20 point improvement. It may be a lot to ask, but if they improve by 20 points again next season, 94 points would be enough to be in the playoff discussion. The Sabres may not be where some expected in the standings, but if the wheels don’t fall off down the stretch they will make a decent improvement. 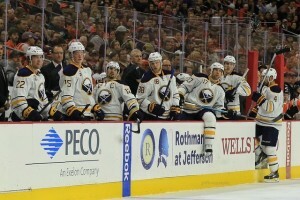 The fancy stats show the Sabres have made significant growth from last season. Buffalo was one of the worst Corsi teams in NHL history in the 2014-15 season. At even strength last season they had a Corsi for percentage of 37.8, which was good enough for dead last in the league. So far this season they have a 48 Corsi for percentage which is tied for 21st. As expected, the goal scoring has improved with the better talent on the roster. Buffalo is on pace for 120 goals at even strength which is a 10 goal improvement over the previous season. In all situations they’re on pace for 194 goals which is a 41 goal upswing. The giant leap can be tied to the upgrade of the power-play. The Sabres already have more goals with the man advantage than all of last season. The power play itself has leaped from 30th to 10th in the league this season. 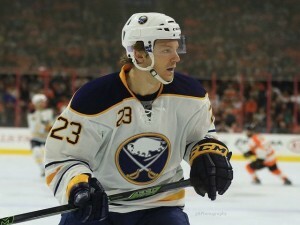 responsible for leading the Sabres where they want to go in the future. The fact that they’re succeeding and carrying the team this season is a very promising sign. The 5 previously mentioned players are all in the top six in scoring on the team. O’Reilly leads the club with 49 points, followed by Eichel (38), Ristolainen (33), Reinhart (26) and Kane (24) in 6th one point behind Jamie McGinn for 5th. If these players were struggling this season I’d be very concerned about the future. However, with the top players on the roster contributing, General Manager Tim Murray just needs to fill in around them. The addition of depth scoring and one more top four blue liner; Buffalo can be a player in the playoff race next season. The standings may not show vast improvement for the Sabres, but when you break it down you can see all the areas the team has grown. I’ll be the first to admit from a wins and losses perspective I’m not pleased with where the club is at and I expected better. At the end of the day though it would be silly to say the team hasn’t come a ways after last season. Buffalo is on an upward trend, but still a lot of work is to be done before the team will be ready to be an annual competitor.